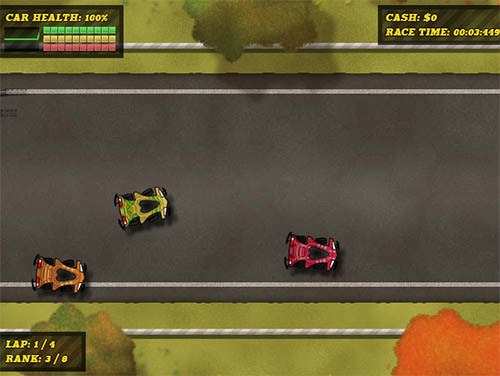 Weapons on Wheels 2 is a fast-paced, action-filled racing game - with a twist. If you can't outmaneuver your opponents, you can just blast them off the road instead! As the name implies, the game is a sequel to the very successful original Weapons on Wheels, which is still receiving nearly 1,000 hits a day - even though it was released over two and a half years ago. This game is built utilizing Flash's Stage3D technology (through the Starling framework) requiring that the game be embedded with wmode = "direct". 12 unique racing levels, utilizing the theme of the 4 seasons. Here are a few screenshots of in-game action. Also, check out the trailer on Youtube.